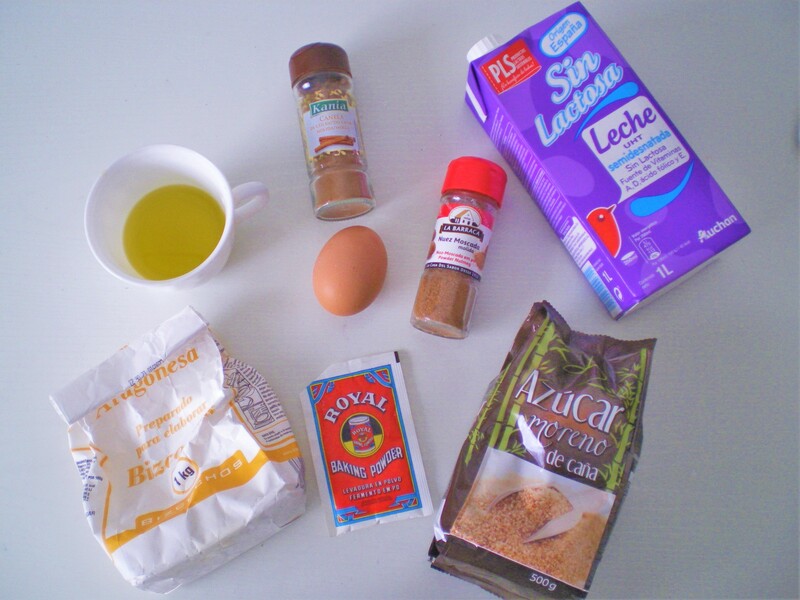 In a bowl combine the olive oil, brown sugar, egg and milk. Mix it properly with a baking whisk or a baking mixer. Once is mixed add in the flour, baking powder, nutmeg and cinnamon. The quantity of cinnamon depends on your taste, I personally added a lot. Stir until is blended but be careful to not overmix. Divide the mixture between 2 mugs, I decided to use two different kinds of mugs. 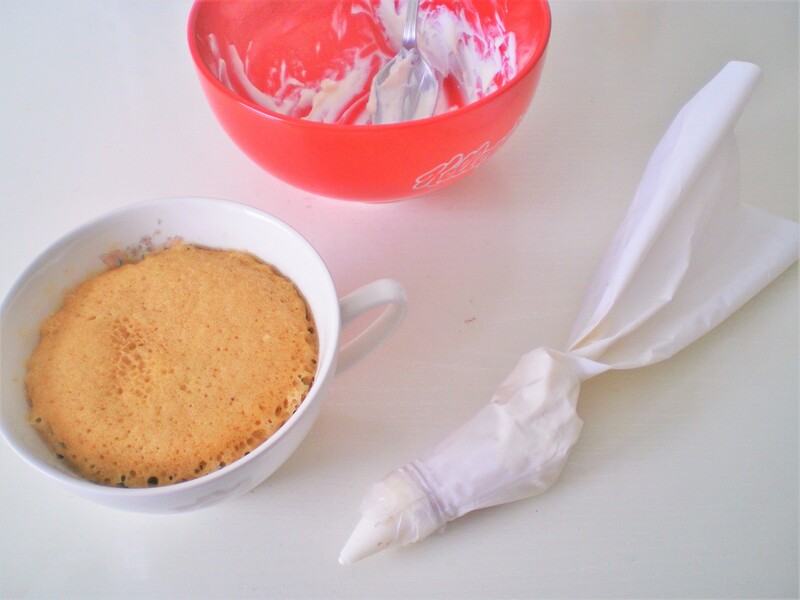 Fill half of each mug with the mixture. Put each mug in the microwave for 1 minute. If it’s still very runny cook it for another 30 seconds. Be careful to not overcook them. Don’t open the microwave door intermediately so it doesn’t de-puff. Although the mug in the left looks prettier, I preferred the taste on the left mug because it wasn’t totally cooked on the bottom. To make the cream cheese frosting, combine some cream cheese and confectioner’s sugar. Add as much sugar as you like depending of how sweet you like it. Mix it until it’s smooth with no lumps. Once the cake is completely cold. Add the frosting in a pipping bag and make the shape of a spiral. To decorate it add a bit of cinnamon on the top. An that’s it, you have your perfect Autumn treat. I hope you like it and if you try this recipe you can share the result with me through Twitter, Instagram or Facebook. What’s your favourite Autumn recipe? Have you made a post about it? So simple but looks yummy! Looks delicious! One question: you have listed olive oil in the ingredients, but have butter instead in the instructions. May I use either one? Thanks! looks delicious! will absolutely be adding this to my ‘in a mug’ recipe list! Looks moist and delicious. Yum! true, you can make any normal cake in the oven, but the microwave is faster! This sounds like October in a mug! Definitely trying this when I get home! This is yummy. A nice morning treat. What an innovative way to welcome autumn! And, it looks so fun and cool as well. That looks and sounds incredibly yummy! Nice job! This looks absolutely delicious and easy I will have to try this soon. I will do ^^ Are you going to be making pumpkin soup by any chance? I would love to see your take on it! This is an awesome and creative cake! I can’t wait to try it out with my Brice and nephews! Hey maybe you can check out my blog and I’d be happy to exchange likes and follows! I love cinnamon. It has become my latest love lately. 🙂 I will write about in some of the future posts on my blog. Ohhh that looks so scrumptious…yummy!!! oh my gosh, i have to try this at home. perfect for a quick dessert that won’t be wasted. thanks for the recipe! Oh my gosh, thank you. I am in LOVE with mug cakes so I’m definitely trying this recipe!! Please visit and follow my blog, https://baking781.wordpress.com/ Thank you! Reblogged this on Audrey Elizabeth. This look like something I would like to try! This looks so delicious – might try making it! I do like your pretty China cup, such a lovely shape. I love a mug cake. 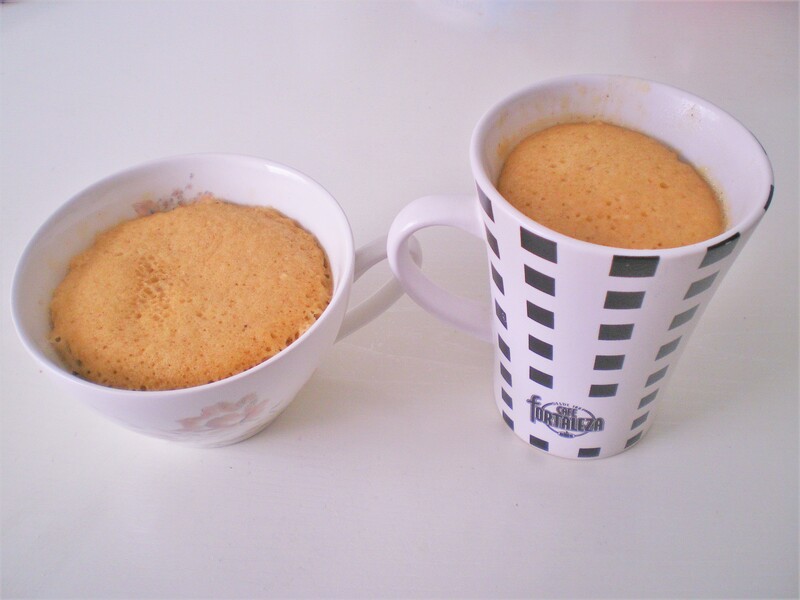 The first time I encountered a mug cake was in a student cook book my mum bought me for going to uni with. Was a fabulous cook book and really tuned me in to mug cakes. Never tried this one though, think I’ll add it to the list of things to try. Love microwave mug cakes!! Thanks for sharing this one!